Once again Webster University faculty members will have a big hand in the next Shakespeare Festival St. Louis tale. The 2017 production of The Winter's Tale will be directed by Bruce Longworth with additional Conservatory faculty members John Wylie (lighting design), Rusty Wandall (sound design) and Dorothy Marshall Englis (costume design) also among those involved. Rick Dildine, adjunct faculty member at Webster since 2009, is artistic and executive director of the festival. The festival also frequently includes talented students from Webster's Conservatory, including several characters and contributors to last (mid)summer's dream of a festival. Longworth's turn marks first time a director has returned for a fourth production in the history of the festival. He previously directed Henry V (2014), Othello (2012) and Hamlet (2010). Longworth, a professor in Webster's Conservatory of Theatre Arts, has been part of Webster since 1985 and the associate artistic director of Shakespeare Festival St. Louis since 2013. In this role, he'll get to direct Shakespeare’s most famous and challenging stage direction: "Exit, pursued by a bear” in Act 3, Scene 3. Whether the Bard meant to use a real bear or an actor in a costume is a directive that has been debated for centuries. Either way, the pursued (Antigonus) and the bear are not seen again after their exit. Wandall is resident sound designer and composer in the Conservatory, where he's been with Webster's Leigh Gerdine College of Fine Arts since 2008. Marshall, costume designer and Conservatory director, has been with Webster since 1979. Both tragic and funny, the production is scheduled June 2-25; preview nights are set for May 31 and June 1. Written in approximately 1610, the play is considered to be one of a group of Shakespeare’s plays that are vaguely defined by their tragic undertones and simultaneous use of straightforward comic situations. Other plays that are grouped in this category include Measure for Measure, The Merchant of Venice, Troilus & Cressida, All’s Well that Ends Well, and Timon of Athens. While this is the first time the Festival will be featuring this play as its main stage show in Forest Park, The Winter’s Tale was adapted for the 2013 Shakespeare in the Streets production Old Hearts Fresh written by Festival playwright Nancy Bell and performed in The Grove. Since its inception in 2001, Shakespeare Festival St. Louis has surpassed the one million mark in attendance through its work In the Schools, In the Streets and In the Park with more than 710,000 people attending the free main stage productions at Shakespeare Glen in Forest Park. 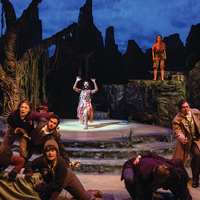 Shakespeare Festival St. Louis receives generous support from the National Endowment for the Arts, the Missouri Arts Council, the Regional Arts Commission, and the Arts & Education Council of Greater St. Louis. For more information, visit www.sfstl.com or call 314-531-9800.